That moment when you’re cleaning out your draft section and you realized that you never finished a series? Yeah, that’s this post right here. This was supposed to be a short post anyways, too! Patron Information — This is still out in the department for parents to take. It is a document holder I’m constantly refilling since patrons are still taking it a year after PBC was finished! Picture Book City Training Manual — This is what I wrote for our Tech Services department and for our Pages. It’s also been used to train new staff members in Reference as well. I will finish this series in the next month (March) with an update about the section after a year and information about doing Picture Book City in Spanish! My “next week” got pushed back quite a bit given the stress of Summer Reading Program preparation, and then I got to participate in the amazing “Show Me the Awesome” initiative! 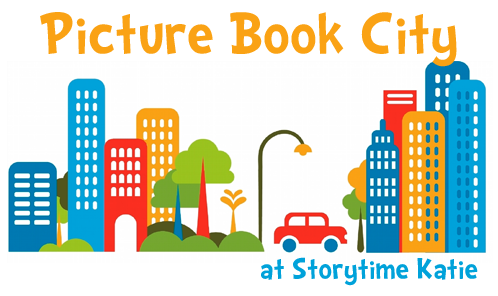 But I’m back with more information about Picture Book City! This time, with several more pictures of signs in the neighborhoods. The endcap directional signs. On the other side, they run backwards — in the order that a patron would see them if they walked in from that side of the stacks. The shelf labels! We went with patron friendly language here. The orange color already indicates “Concepts,” so we listed the street on the label. The shelf labels are mostly to help our clerks and pages re-shelve correctly — they are adjusting to PBC, too — but it also looks so clean and nice and organized. It makes my librarian heart happy. A full section, with signs! Overall, I’ve been ridiculously happy with the signs and their reception by patrons in Picture Book City! Next time, I’m planning on posting the final list of neighborhoods/streets & including the information sheet that we have available in the Youth Services area for patrons to use! One of my biggest concerns and thoughts about re-organizing the picture book was that I really wanted to make it very clear to patrons that this change was about them being able to find their own materials. To help them in that endeavor, I knew that we needed to put up lots and lots of signs. Our overhead sign, hanging from the ceiling. I made this sign in Publisher and my fabulous co-worker backed it with poster board. It looks beautiful (despite the awful fluorescent lights in the picture) and it really pops in the department. Signs in the bookcases, at the beginning of each neighborhood. This one is from the Bedtime neighborhood. Another Publisher file that I worked on. I color-matched the heading to the color of the label, hoping for good color recognition by our patrons. Right now, we’re working on more signs for Picture Book City after sitting with it for a month to make sure we weren’t moving everything all over again. This week at the library, I’m making endcap directions and my co-worker is working on individual shelf labels. I’ll post pictures of those next week! This post is LONG overdue, but as soon as I had written it, we had to change everything in the catalog and start over! My library’s copies are the first two listed. I loved how this looked in the catalog. I thought it was very clear that the neighborhood and street were linked. My staff members had learned how to read the calls again, and patrons were giving us positive feedback. And then we ran a report. Still functioning, but I miss those slashes. Staff and patrons have adjusted from this change (we made it about a month ago now), and everyone is still able to navigate without the slashes. I will likely always miss the look of them, but understand and support letting them go for functionality. Next up, signs in Picture Book City! Besides the obvious re-cataloging going on, I’m still purchasing new books. As they arrive in the library, I now have the task of reading each book and deciding where it will go in our neighborhoods. Messy desk, with books in process! When new books arrive, I take them back to my desk and read the, to figure out where they will go. It’s a bit of a messy process as you can see from the picture! If I have trouble deciding where the book will go, I do look in our catalog and see what subject headings have been assigned. 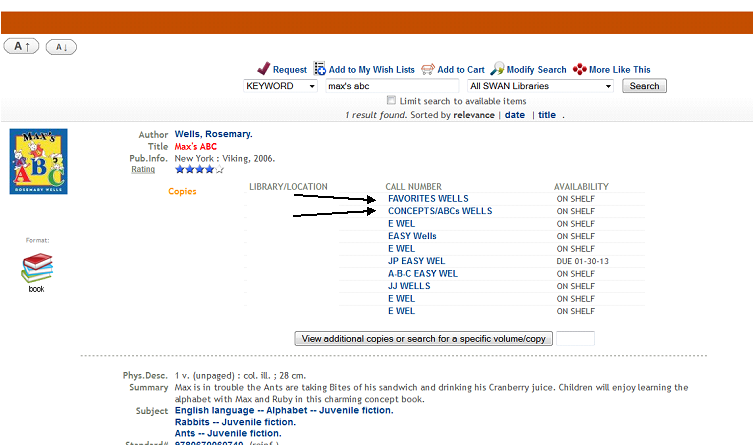 (Since we’re a part of a large consortium, it is rare that we are the first library to receive any title.) Sometimes that helps and sometimes it confuses me even more! The biggest problem that I’ve come across is when I want to be a book into two different neighborhoods. Larger libraries would have the option of buying a second copy, but with $1000 for picture books for the year, I don’t always have the option. So I’ve been keeping a wishlist of titles that I would like doubles of if I can get them/afford them. After I decide where the books are going, I make the labels and take them back to Tech Services where they then get barcoded and added to the catalog. Next week, come back for a look at how the books appear in our catalog and a status update on how complete the project is after a full month of working on it! In this installment, I’m going to be talking about the difficulties in moving some non-fiction into Picture Book City. For the most part, integrating non-fiction into the subject categories was a really easy thing to do. Animals? Straight into Nature. Community Helpers? Growing Up / Jobs. Fairy tales, nursery rhymes, songs, everything had a place. Except for a lot of the 100s. Where do we put those books on loss? Divorce? Abuse? Should we create a Parenting Section and move all those titles there? But what about the picture books like “I Remember Miss Perry” (teacher loss) and “Remembering Crystal” (friend dies) that were already in picture books? Should we pull all the tough topic books out? After a few days of asking Twitter for suggestions about Parenting Sections, I ultimately decided that we didn’t have the shelf space or the need to have a parenting section. 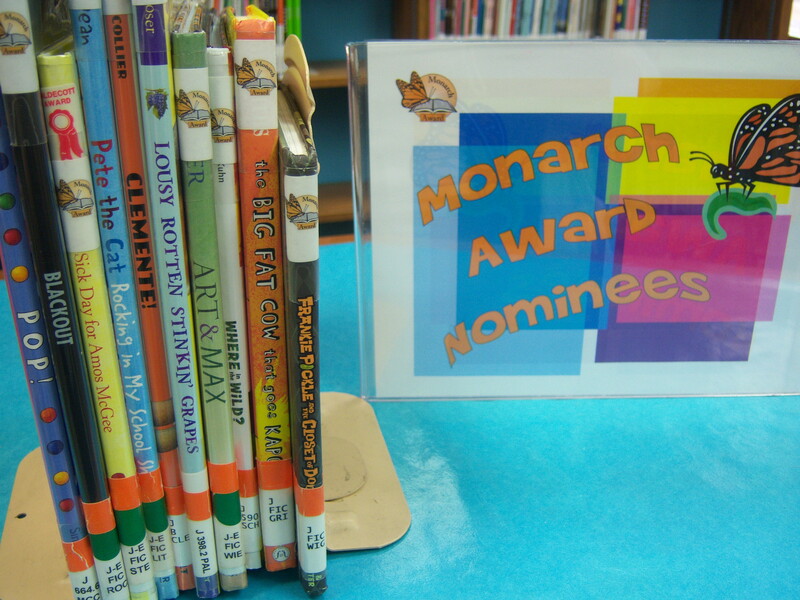 But I needed to make a rule about what kind of books went into Picture Book City and what books went in J Non-Fiction. I decided that topics that every child goes through (loss, in particular) should go in Picture Book City if it was in picture book format. Topics that are not universal (divorce, abuse) wound up in J Non-Fiction. We have updated our pathfinders for parents who are hesitant to ask for books, and are monitoring the situation to see if I need to re-think the decision. Part of Picture Book City is taking a chance, making a change, and be willing to throw it out if it doesn’t work! Next week, I’ll talk about our largest section so far — Favorites. This week, I’m talking labels and re-cataloging! Since we had decided to merge two collection (J-E FIC and J-E Non-Fic), we needed to come up with a brand-new way to do the labels for the new neighborhoods. Already, we had decided to list full neighborhood and a street on the label, with a slash in-between them to distinguish for both pages/clerks and patrons. One change that I knew I wanted was to have the full author’s last name instead of the previously done three letter abbreviation. With this new system, “WIL” wouldn’t be a mixed-up shelf with Willems, Wilson, Williams, etc. interfiled. Ultimately, we wanted to work with what we already had in-house supplies as far as labels went. All of our books — both Youth and Adult — use the same Uline labels (S-10770 if anyone wants to be super specific!) and Demco clear label protectors (SKU# 12882640). So I came up with how much more room I had under the label protectors and found a label system that I really like from The Library Store. We are using the 3/4″ by 1″ size in the following colors: Violet, Red, Orange, Blue, Pink, Yellow, Green, Lavender, White, and Tan. The colors pictured online vary a bit from what’s pictured online, but we’ve been really happy with what we’ve received. All of our spine labels in Non-Fiction are done vertically and we went that way with Picture Book City so that everything was easy to be read. The few problems are with the very tiny spines of media tie-in paperbacks. 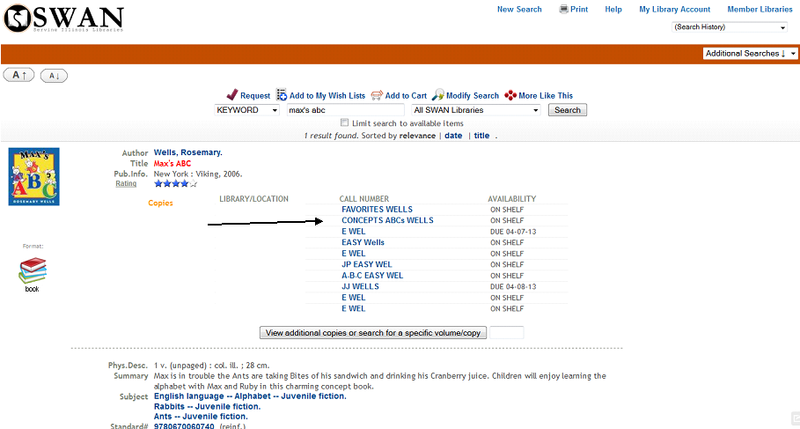 As for our cataloging — yes, we are changing everything in the catalog. That means locations, types, call numbers — EVERYTHING. Since the idea for the project originated from my Circ/Tech manager, we have the full support of Technical Services. Youth Services support staff, teen volunteers, and myself peel old labels off and clean books. I read each book and decide where it will go, make the label, and put the labels on. I also mark the book off on a master list of our picture books so that I can make sure we are accounting for every book. Technical Services make changes in the catalog. Pages/Clerks re-shelf items and shift if needed. Basically, since we are a small to medium sized library, we just keep plugging along doing what we can each day to get this project done. Our projected completion date is before May, so I can concentrate on summer reading visits! 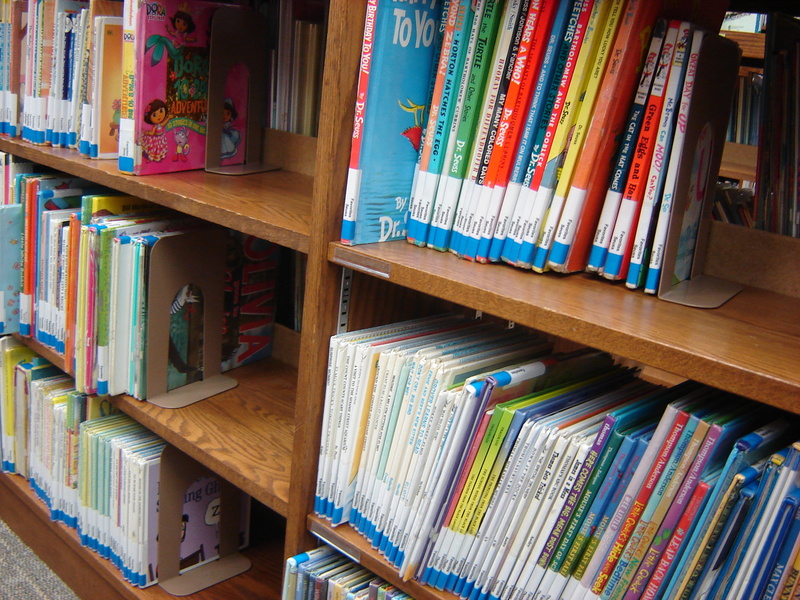 Next week, the first book section that stumped me…the 100s and “parenting” books! Welcome to Picture Book City! Last year, around this time, my Circulation/Technical Services Manager approached me about something she had recently learned about a meeting — organizing picture book by subjects. She wanted to know my thoughts on it. I told her that it seemed like a good idea to me and that I knew a few neighboring libraries had done it to at least part of their collection. 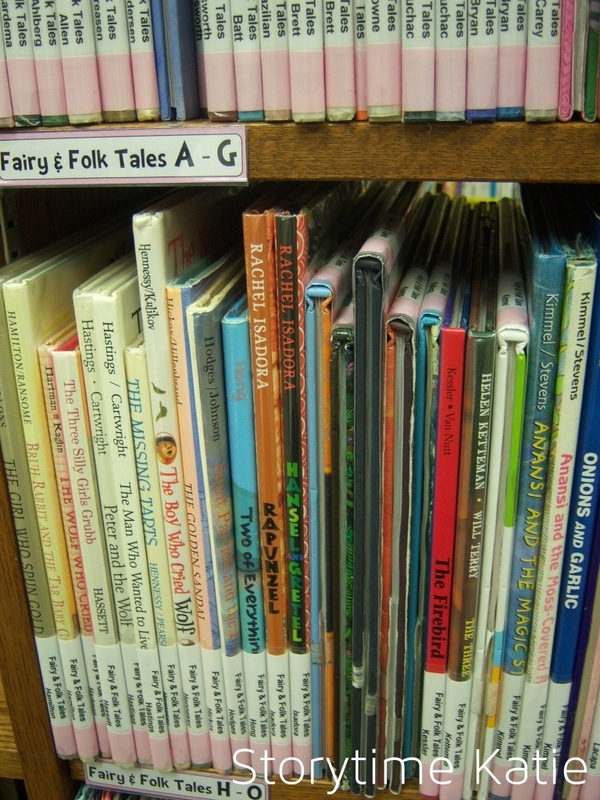 I promised to do my research and that once our big non-fiction project had been completed (re-labeling, weeding, and re-cataloging almost every book), I would be game to start on the picture books. Fast forward to ALA Annual in June and I was unbelievably inspired by the presentation, “I Want a Truck Book!” (Link to materials are all located here on ALA Connect.) That presentation was worth the conference registration all by itself. When Gretchen spoke about the neighborhoods they had created, that was exactly what my library needed. 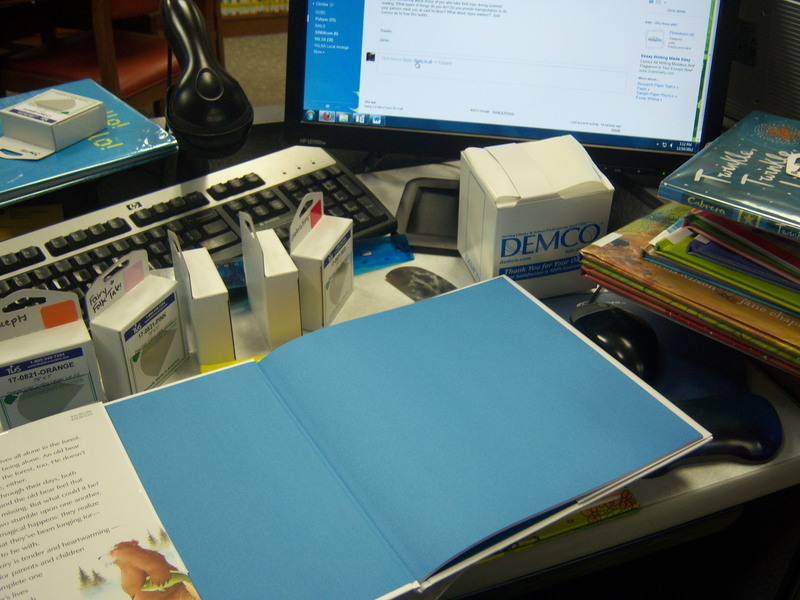 And especially as the only children’s librarian, it was what I needed — a proven way to make this re-organization work when I’d be the only one making decisions. When Amy posted at The Show Me Librarian in August about her kidlit re-organization, my excitement only grew. Amy had given me the kid-friendly name I was looking for to call our collection — Picture Book City! Finally, in November our non-fiction project was done and I began. 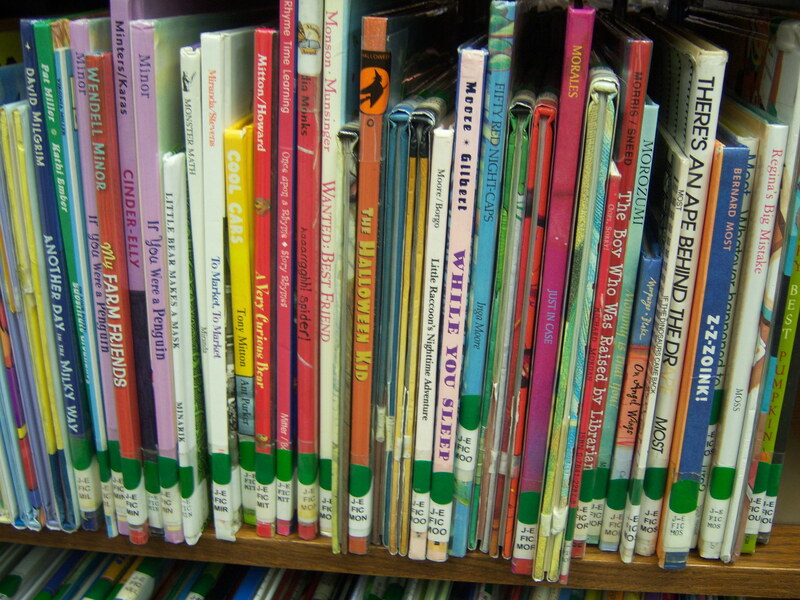 Can you find a truck book in our picture book section? 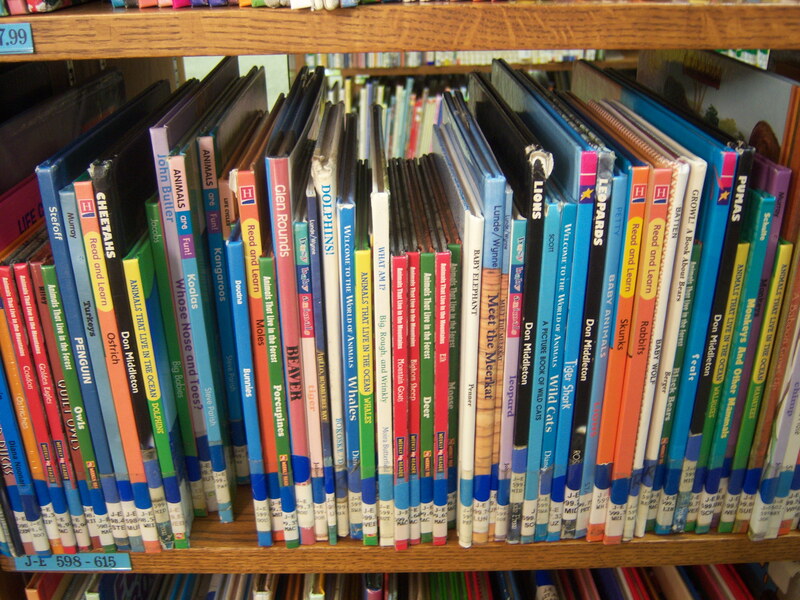 We started with approximately 6,000 picture books, both fiction and non-fiction. 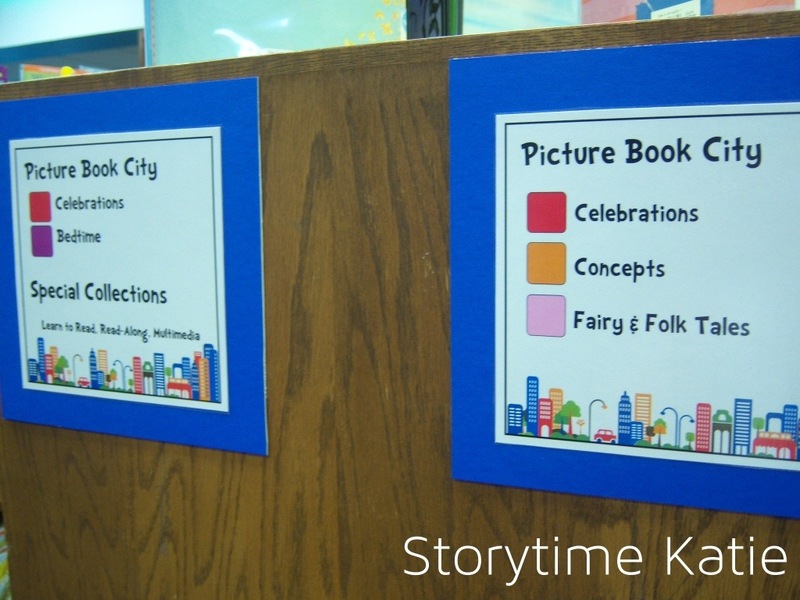 It was my goal to get rid of our “blue dots” (non-fiction) and “green dots” (fiction) and integrate both into Picture Book City. I wanted to do this because I felt like our community didn’t understand what our easy non-fiction was. Also, the whole point of this project is to give the kids ALL the dinosaur books at once — I didn’t want to run back and forth between two sections. 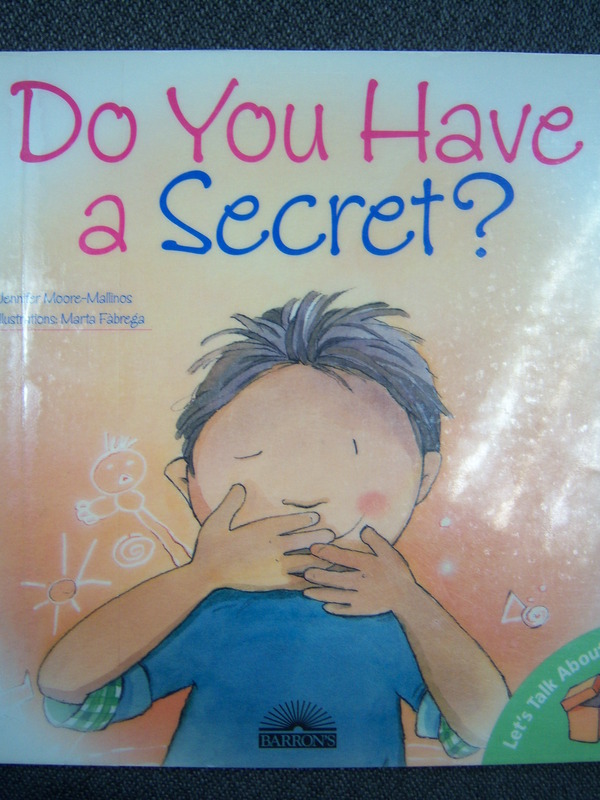 I started with non-fiction, weeding as I went and also replacing a lot of materials. Reading each book forced me to evaluate whether or not the material was current and relevant anymore. I purchased some new materials about community helpers, the new “my plate,” and updated many more volumes. While going through the blue dots, I began to realize that I wanted a bit more organization in my neighborhoods. A co-worker from the Adult Services department came up with the idea of “streets” in our neighborhoods. I began to develop some streets. 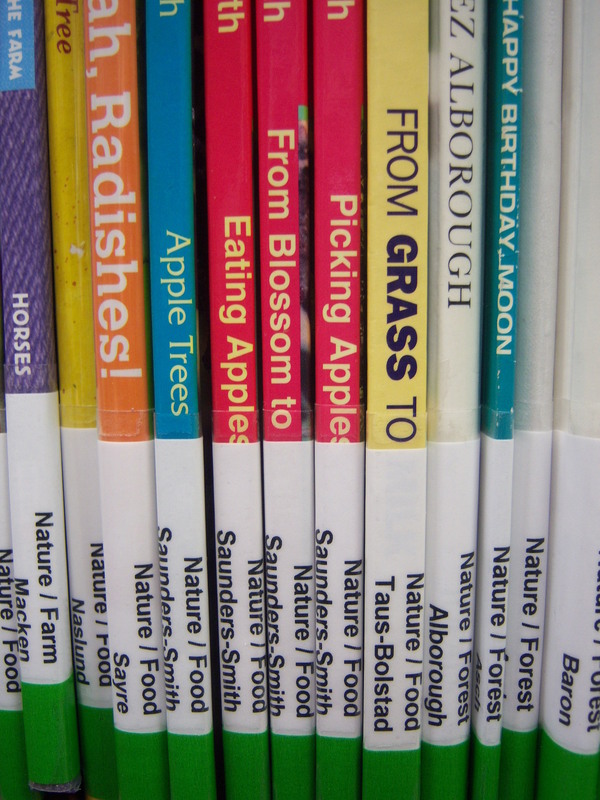 For example, in our “Nature” neighborhood, we have animals separated by where they live: “Nature / Farm”, “Nature / Forest,” “Nature / Ocean,” “Nature / Pets,” “Nature / Zoo.” I hadn’t planned on doing this originally but incorporating the non-fiction made it almost necessary for patrons to find materials. Already, I am receiving tons of great feedback from parents. When I finish this project, I will post a full list of our streets. This has been quite a process and I’m very happy to share my journey — both satisfaction and frustration — as I go along. Let me know if you have any specific questions and I will do my best to address them in a future post! As I’m going alone with the process, I’m hoping to have everything done by the time I have to do school visits for summer reading. I am blessed to have help from Tech Services to change the call numbers in the catalog and some support staff who have agreed to peel our old labels off. 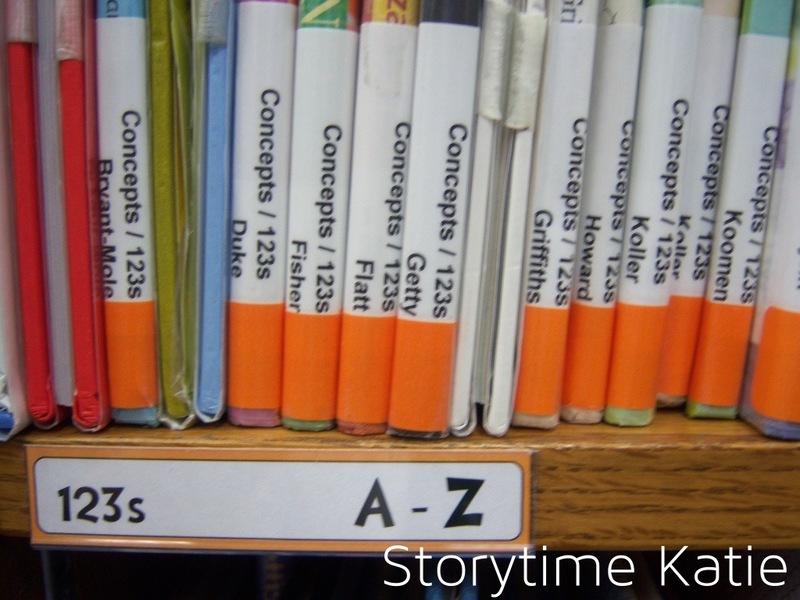 Next week…how we chose to label and re-catalog our books and why!